Here is what we know about Manti Te'o: He is an exceptional football player. He's a projected first-round NFL pick. He finished second in the Heisman voting, and he won a haul of other trophies: the Walter Camp, the Chuck Bednarik, the Butkus, the Bronko Nagurski. In each of his three seasons as a full-time starter, he racked up at least 100 tackles. We also know that Te'o is a devout Mormon. When asked why he picked Notre Dame over Southern California, the school he had supported while growing up in Hawaii, he said he prayed on it. "Faith," he told ESPN, "is believing in something that you most likely can't see, but you believe to be true. You feel in your heart, and in your soul, that it's true, but you still take that leap." But that's where the definite ends. From here, the rest of Te'o's public story begins to grade into fantasy, in the tradition of so much of Notre Dame's mythmaking and with the help of a compliant press. Nov. 28, 2009: Te'o and Kekua meet after Stanford's 45-38 victory over Notre Dame in Palo Alto, according to the South Bend Tribune: "Their stares got pleasantly tangled, then Manti Te'o extended his hand to the stranger with a warm smile and soulful eyes." 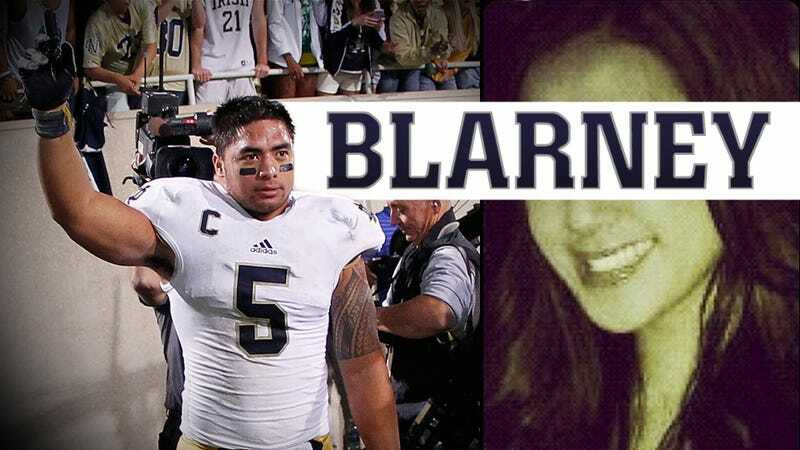 Kekua, a Stanford student, swaps phone numbers with Te'o. 2010-2011: Te'o and Kekua are friends. "She was gifted in music, multi-lingual, had dreams grounded in reality and the talent to catch up to them" (South Bend Tribune). "They started out as just friends," Te'o's father, Brian, told the Tribune in October 2012. "Every once in a while, she would travel to Hawaii, and that happened to be the time Manti was home, so he would meet with her there." Early 2012: Te'o and Kekua become a couple. They talk on the phone nightly, according to ESPN. Some time in 2012: Kekua has a car accident somewhere in California that leaves her "on the brink of death" (Sports Illustrated). But when? Eight months before she died of cancer, in September, reports ESPN. "About the time Kekua and Manti became a couple," reports the South Bend Tribune. April 28, reports SI. Te'o talks to Lennay nightly, "going to sleep while on the phone with her," according to Sports Illustrated. "When he woke up in the morning his phone would show an eight-hour call, and he would hear Lennay breathing on the other end of the line." Sept. 10, 2012: Kekua is released from the hospital; Manti's father, Brian, congratulates her "via telephone" (South Bend Tribune). Less than 48 hours later [after Lennay's release from the hospital], at 4 a.m. Hawaii time, Kekua sent a text to Brian and Ottilia, expressing her condolences over the passing of Ottilia's mom, Annette Santiago, just hours before. Brian awakened three hours later, saw the text, and sent one back. There was no response. A couple of hours later, Manti called his parents, his heart in pieces. Or does Kekua die three days later (New York Post)? Four days (ESPN, CBS)? In any case, according to Te'o's interview with Gene Wojciechowski in a segment aired during the Oct. 6 episode of College GameDay, Lennay's last words to Te'o were "I love you." Sept. 12, 2012 (morning): Te'o is informed of his grandmother's passing (Sports Illustrated). Sept. 12, 2012 (afternoon): Te'o is informed of Kekua's passing by her older brother, Koa (Sports Illustrated). Sept. 15, 2012: Te'o records 12 tackles in leading the Irish to an upset win over Michigan State. Sept. 22, 2012: Kekua's funeral takes place in Carson, Calif. (The Associated Press puts it in "Carson City, Calif.," which does not exist.) Te'o skips the funeral, saying Kekua had insisted that he not miss a game (Los Angeles Times). Her casket is closed at 9 a.m. Pacific time, according to Te'o. That night, Notre Dame beats Michigan, 13-6, to go to 4-0, the school's best start in a decade. Te'o intercepts two passes. After the game, he says of Lennay: "All she wanted was some white roses. So I sent her roses and sent her two picks along with that." Notre Dame head coach Brian Kelly awards the game ball to Lennay Kekua, handing it to Te'o to "take back to Hawaii." It was around this time that Te'o's Heisman campaign began in earnest, aided in part by the South Bend Tribune. He appeared on the cover of Sports Illustrated's Oct. 1 issue, above the headline, "The Full Manti." And it was around this time that Manti and his father began filling in details about the linebacker's relationship with Lennay. Brian Te'o told multiple reporters that the family had never met Kekua; the Te'os were supposed to spend time with her when they visited South Bend, Ind., for Notre Dame's Senior Day on Nov. 17. The elder Te'o told the South Bend Tribune in October, "[W]e came to the realization that she could be our daughter-in-law. Sadly, it won't happen now." Lennay Kekua's death resonated across the college football landscape—especially at Notre Dame, where the community immediately embraced her as a fallen sister. Charity funds were started, and donations poured into foundations dedicated to leukemia research. More than $3,000 has been pledged in one IndieGogo campaign raising money for the Leukemia & Lymphoma Society. Babe, if anything happens to me, you promise that you'll stay there and you'll play and you'll honor me through the way you play. This week, we got in touch with a woman living in Torrance, Calif. We'll call her Reba, to protect her identity. She was initially confused, then horrified to find that she had become the face of a dead woman. "That picture," she told us over the phone, "is a picture of me from my Facebook account." Manti Te'o and Lennay Kekua did not meet at Stanford in 2009. The real beginning of their relationship apparently occurred on Twitter, as an encounter between @MTeo_5 and @lovalovaloveYOU, on Oct. 10, 2011. Here's the moment they first made contact. Lennay Kekua's Twitter name was @lovalovaloveYOU from 2011 until April 2012, @LennayKay from April until September 2012, and has been @LoveMSMK ever since. Their interactions, by and large, consisted of mild flirting. By January 2012, they were a "couple," and Te'o sprinkled #LMK (for Lennay Marie Kekua) throughout his Twitter timeline in 2012. As for what Kekua was tweeting, we have only bits and pieces. Her Twitter was private during most of this time, though various Google caches reveal her ever-changing series of avatars and a handful of Twitpics. That photo hadn't appeared on the internet—at least, not to Reba's knowledge. She had taken it in December 2012 and sent it directly to an old high school acquaintance. The two hadn't talked since graduation, but the classmate, whom Reba remembered fondly, contacted her on Facebook with a somewhat convoluted request: His cousin had been in a serious car accident, and he had seen her photos before and thought she was pretty. Would she be so kind as to take a picture of herself holding up a sign reading "MSMK," to put in a slideshow to support the cousin's recovery? (He didn't explain what MSMK meant, and Reba still doesn't know.) Baffled but trusting, Reba made the sign and sent along the photo. And now here it was on a dead girl's Twitter profile. After googling Lennay Kekua's name, Reba began to piece things together. She called up the classmate. He expressed alarm, Reba told us later, and "immediately began acting weird." "Don't worry about it," he told her. Moments after the phone call, Reba's picture was removed from the @LoveMSMK Twitter profile. Then, in a series of lengthy phone calls, Reba told us everything she knew about the classmate, a star high school quarterback turned religious musician named Ronaiah Tuiasosopo. Tuiasosopo, now 22, had once been something of a football prospect himself. In 2005, the Los Angeles Daily News wrote that the young Tuiasosopo, then the sophomore starting quarterback for Antelope Valley High School in Lancaster, Calif., "looked like a star" in practice, despite some in-game growing pains. His coach said he was a "great kid" who did a fine job leading the older seniors. He was an honorable mention for the all-league team. But then he transferred out of town, to Franklin High in Stockton, where he spent his junior year living with an aunt and handing the ball off. His team featured two 1,000-yard rushers, and he completed only five passes all season. He transferred again: His senior year, he turned up at Paraclete High in Lancaster. Titus, his father, had become an assistant coach there. That's where he encountered Reba. His team lost in the semifinals. A season recap article suggested that he might sign with Hawaii, but that evidently went nowhere. Once high school ended, in 2008, Tuiasosopo threw himself into his father's church. Titus is the pastor at the Oasis Christian Church of the Antelope Valley, and Ronaiah leads the church's band. He also has his own little YouTube music career. He sings secular songs, with a cousin (Conan Amituanai, a former Arizona lineman whom the Vikings once signed), and religious songs, both solo and as part of an ensemble. "Ignite," the lead single on the group's ReverbNation page, is a likable enough song. It borrows its chorus from Katy Perry's catchy "Firework." But the song only has 10 Facebook likes, a fairly low figure that seems especially low once one considers who plugged Tuiasosopo's single on Twitter in December 2011: Manti Te'o. Te'o and Tuiasosopo definitely know each other. In May 2012, Te'o was retweeting Tuiasosopo, who had mentioned going to Hawaii. Wrote Te'o, "sole"—"bro," in Samoan—"u gotta come down." In June, Te'o wished Tuiasosopo a happy birthday. How they know each other isn't clear. We spoke to a woman we'll call Frieda, who had suggested on Twitter back in December that there was something fishy about Lennay Kekua. She was Facebook friends with Titus Tuiasosopo, so we asked her if she knew anything about Ronaiah. "Manti and Ronaiah are family," she said, "or at least family friends." She told us that the Tuiasosopos had been on-field guests (of Te'o or someone else, she didn't know) for the Nov. 24 Notre Dame-USC game in Los Angeles. USC was unable to confirm this, but a tweet from Tuiasosopo's since-deleted account suggests he and Te'o did see each other on that West Coast trip. "Great night with my bro @MTeo_5! #Heisman #574L," Ronaiah tweeted on Nov. 23, the night before the game. And there was something else: Tuiasosopo had been in a car accident a month before Lennay's supposed accident. Was this Lennay Kekua? We spoke with friends and relatives of Ronaiah Tuiasosopo who asserted that Ronaiah was the man behind Lennay. He created Lennay in 2008, one source said, and Te'o wasn't the first person to have an online "relationship" with her. One mark—who had been "introduced" to Lennay by Tuiasosopo—lasted about a month before family members grew suspicious that Lennay could never be found on the telephone, and that wherever one expected Lennay to be, Ronaiah was there instead. Two sources discounted Ronaiah's stunt as a prank that only metastasized because of Te'o's rise to national celebrity this past season. Te'o also wished U'ilani a happy Thanksgiving on Nov. 22. A few weeks later, the @uilanirae account was deleted. The deletion came immediately after tweets from two now-suspended Twitter accounts had alleged that U'ilani was a fraud, that the same person behind Lennay was operating the U'ilani account, and that the images of "U'ilani" were really of a woman named Donna Tei. Tei's Twitter account is @FreDonna51zhun; Fred Matua wore No. 51, and Tei's profile is full of pictures of herself with the late football star (and cousin of Tuiasosopo's). We showed U'ilani's Twitter avatar to one of Tei's friends, and he confirmed it was her. In yet another now-deleted tweet, Tei herself reached out to Nev Schulman, star of the 2010 film Catfish and executive producer of the MTV program of the same title. Schulman's movie and show are about romantic deception through fake online personas. Manti Te'o, meanwhile, has deleted his tweets mentioning U'ilani. There was no Lennay Kekua. Lennay Kekua did not meet Manti Te'o after the Stanford game in 2009. Lennay Kekua did not attend Stanford. Lennay Kekua never visited Manti Te'o in Hawaii. Lennay Kekua was not in a car accident. Lennay Kekua did not talk to Manti Te'o every night on the telephone. She was not diagnosed with cancer, did not spend time in the hospital, did not engage in a lengthy battle with leukemia. She never had a bone marrow transplant. She was not released from the hospital on Sept. 10, nor did Brian Te'o congratulate her for this over the telephone. She did not insist that Manti Te'o play in the Michigan State or Michigan games, and did not request he send white flowers to her funeral. Her favorite color was not white. Her brother, Koa, did not inform Manti Te'o that she was dead. Koa did not exist. Her funeral did not take place in Carson, Calif., and her casket was not closed at 9 a.m. exactly. She was not laid to rest. Lennay Kekua's last words to Manti Te'o were not "I love you." A friend of Ronaiah Tuiasosopo told us he was "80 percent sure" that Manti Te'o was "in on it," and that the two perpetrated Lennay Kekua's death with publicity in mind. According to the friend, there were numerous photos of Ronaiah Tuiasosopo and Te'o together on Tuiasosopo's now-deleted Instagram account. The sheer quantity of falsehoods about Manti's relationship with Lennay makes that friend, and another relative of Ronaiah's, believe Te'o had to know the truth. Mostly, though, the friend simply couldn't believe that Te'o would be stupid enough—or Ronaiah Tuiasosopo clever enough—to sustain the relationship for nearly a year. Since Notre Dame was blown out in the BCS national championship game, Te'o has kept a low profile. He has tweeted sparingly, and he declined an invitation to the Senior Bowl. His father made news recently when he announced on the "Manti Te'o 'Official' Fan Club" Facebook page that he had "black listed" the Honolulu Star-Advertiser, which had carried a photo on its front page of Manti getting bowled over by Alabama's Eddie Lacy in the title game. As of this writing, Te'o's Twitter profile carries a quotation from Alexandre Dumas's The Count of Monte Cristo, the great adventure novel about a man in disguise. Life is a storm.. You will bask in the sunlight one moment, be shattered on the rocks the next. What makes you a man is what you do when that storm comes. We called a cellphone for Manti Te'o, but the number we had is not accepting calls. Brian Te'o, Manti's father, was in a meeting when we called, according to a text message he sent in response. Ronaiah Tuiasosopo did not answer his phone or respond to multiple text messages. We left a message with Notre Dame earlier this afternoon. We'll update with comments when and if we get any. This is incredibly embarrassing to talk about, but over an extended period of time, I developed an emotional relationship with a woman I met online. We maintained what I thought to be an authentic relationship by communicating frequently online and on the phone, and I grew to care deeply about her. To realize that I was the victim of what was apparently someone's sick joke and constant lies was, and is, painful and humiliating. It further pains me that the grief I felt and the sympathies expressed to me at the time of my grandmother's death in September were in any way deepened by what I believed to be another significant loss in my life. I am enormously grateful for the support of my family, friends and Notre Dame fans throughout this year. To think that I shared with them my happiness about my relationship and details that I thought to be true about her just makes me sick. I hope that people can understand how trying and confusing this whole experience has been. In retrospect, I obviously should have been much more cautious. If anything good comes of this, I hope it is that others will be far more guarded when they engage with people online than I was. Fortunately, I have many wonderful things in my life, and I'm looking forward to putting this painful experience behind me as I focus on preparing for the NFL Draft. Update (Feb. 14, 2013): CBS This Morning video edited at request of CBS. Additional reporting by Dom Cosentino and Tom Ley. Top image by Jim Cooke/photo by Getty. Email Tim Burke at tim@deadspin.com or find him on Twitter @bubbaprog. Jack Dickey is at dickey@deadspin.com and @jackdickey. Please send any media requests to media@gawker.com. New to Deadspin? Read some of our greatest hits.